If you have recently welcomed a new kitten into your home please accept our congratulations. We recognise that getting things right throughout their growth is vital as this is one of the most intense and important stages in your new arrival’s life. We want to support both you and your kitten as best we can throughout this rapidly changing period. Regular, frequent meals of kitten food in the same place and at the same times each day to help establish a structure. When it comes to food, it is a good idea to stick to your new kittens existing routine as much as possible for the first few days. It is a good idea to ask the breeder to supply you with a small amount of your companions’ current diet. Once those first few days are over and your companion is settled, you can start to introduce a ROYAL CANIN® diet (one designed for growth) very gradually, over 5-7 days, if you want to switch. Once your kitten has made the change, follow the feeding guides on the pack closely, as these will differ month by month as your kitten grows. Most kittens initially need at least 3 or 4 meals per day but the meal frequency can usually be reduced to 2 or 3 meals per day as they grow. During the first few weeks, allow your new arrival a few days of quiet rest to help ease settling in. Then offer gentle play, keeping play times short, with appropriate toys, used under supervision. 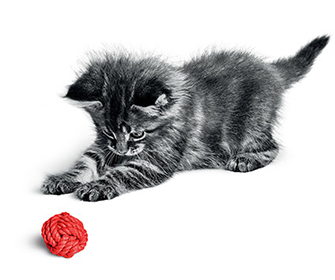 Ensure there is no confusion and only allow and reward play behaviour that you will continue to encourage as your kitten grows up. Ignore any inappropriate behaviour, even if it seems endearing in a young animal e.g. jumping up, climbing on furniture, mouthing and scratching. 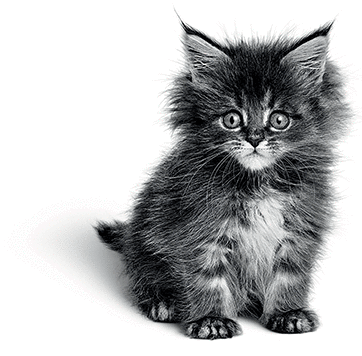 Don’t let your kitten outside until they have had their vaccinations. If you are not sure what is safe for your unvaccinated pet, speak to your vet for advice. Many vets will recommend keeping kittens inside until they are neutered, as early pregnancies are always a possibility. Remember it is very important to socialise your pet from a young age. We all want a happy, friendly and confident pet, but many owners don’t realise that it is what their kitten experiences at an early age that is most important for this. The period known as the ‘socialisation window’, is the time during which your kitten is much more accepting of any new situations and encounters. The more they experience during that time, the more they will be comfortable with as an adult. However, for an emotionally well-balanced companion, the best thing is to continue with ongoing socialisation opportunities throughout their life.